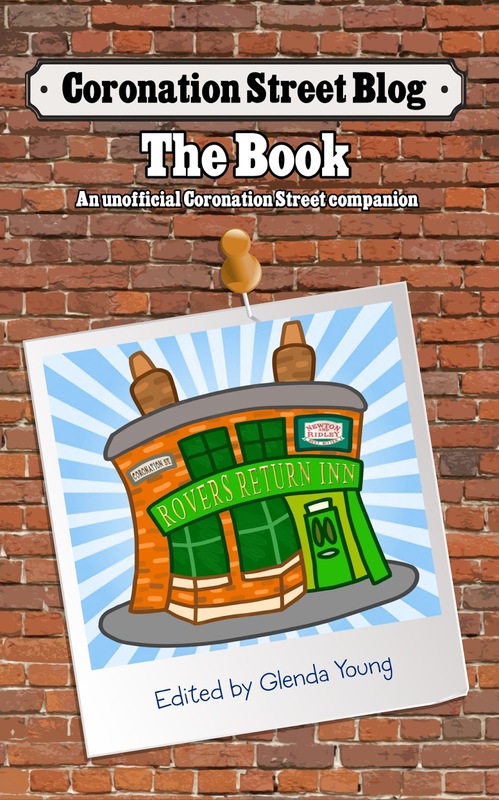 ITV Coronation Street are today celebrating 20 years since the official opening of Roy's Rolls on Victoria Street. On the night before the opening of Roy's Rolls, Hayley got her tights snagged on a nail sticking out of the skirting board, so she pulled the nail out - and strangely, very strangely, this flooded the cafe - the nail had gone through a water pipe. It was chaos the next morning when Roy and Hayley woke up to discover what had happened and Roy was screaming for Steve McDonald's blood. The plumber arrived and fixed the pipe, but it turned out that it was Gary Mallett who put the nail through the pipe in the first place - so Steve makes Gary help Roy put the place straight, although doesn't let on to Roy that it was all Gary's fault. Here's a quick romp through Roy's tenure at the cafe courtesy of the official ITV Corrie twitter account. However, one thing that isn't included is surely one of the most important - Roy and Hayley's first "wedding" inside. Treat yourself to a bacon butty - it's Roy's Rolls 20th Anniversary! And if you'd like to read all of Roy's trials and tribulations at the cafe, they're all detailed in A Perfect Duet: The Diary of Roy and Hayley Cropper. Watching Coronation Street last night I was once again impressed by the way Tracy has been softly, subtly and gently transformed from the toxic man-killing Tracy that we all knew and love into the very epitome of maternal love for Amy. The change began after Deirdre died and has continued since, in a very natural way which has worked to make Tracy's change believable. It set me off wondering if I would consider Tracy McDonald now to be a Coronation Street legend and I have to admit that I would. Which of course, set me off wondering which other current Corrie characters would be considered legends at this time. 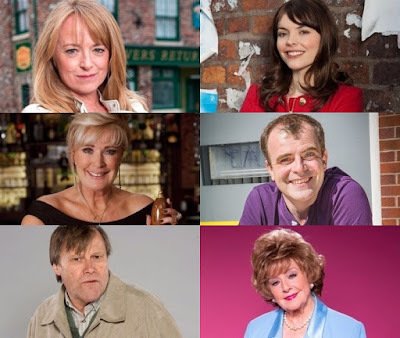 For me, it would be the ones pictured above - Jenny BradleyConnor, Steve McDonald, Liz McDonald, Roy Cropper and of course my favourite character, Rita Tanner. Who are your Coronation Street legends right now - the ones we'll remember in years to come, even if they're no longer part of the show? 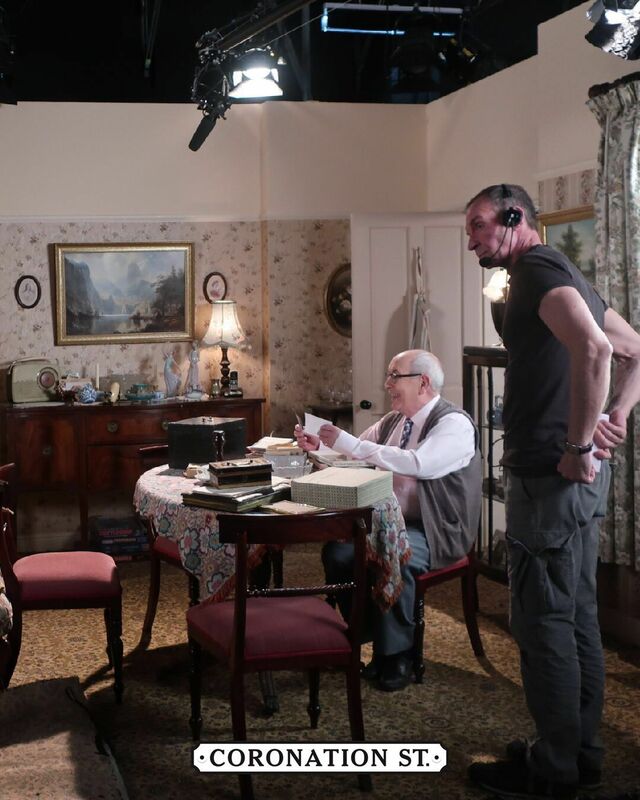 Good news for fans of Malcolm Hebden as Coronation Street. He's back filming as Norris Cole, as the official ITV Coronation Street twitter account has confirmed with this picture today. We'll see him on screen in April. 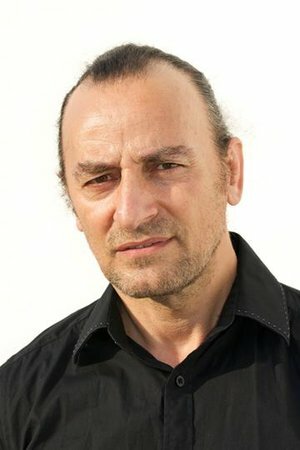 Malcolm has been away from the show after suffering a heart attack that left him in a coma. He praised the Blackpool hospital where he was treated, saying: “Most of December I was in an induced coma, in the care of these brilliant, wonderful people at the Cardiac Intensive Care Unit. Fortunately I didn’t realise how bad it was; I was dying. The cardiac team, headed by Mr Zacharias, simply saved my life." 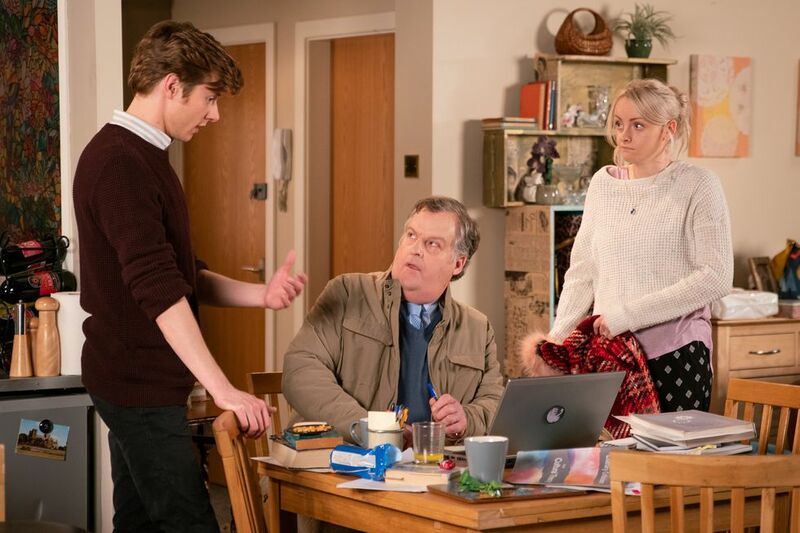 As promised, here is part two of Wednesday's Corrie, all wrapped up in a handy blog review. Tracy tells Steve that Amy has had a miscarriage and Amy lies, telling her mum she went to the hospital three days ago. Feeling guilty, Tracy wishes she and Steve had been there for, but Amy tells her that Bethany was by her side. At No. 8, Shona finally admits to David about the DVD and the drugs deal. Realising that they can't overcome Clayton, he decides it's time she left the house for good. Brian struggles to rescue Daniel's essay conclusion and admits defeat. Facing the truth, he decides it's time to tell Daniel (via Sinead) on a visit to the Rovers. All is saved anyway as Daniel had the essay backed-up and hastily emails his work to university, which Brian has completed. 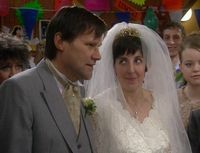 Also at the Rovers, Kevin admits to Sally that he took the cash, and used it to pay for Jack's digital detox trip. Gina, however, still decides its time to leave Weatherfield for Newcastle, but not before taking some time to contemplate in the community garden. Soon consoled by Kevin, Gina's mind is changed and her ex-brother-in-law offers her a place to stay at his house. Sally meanwhile, tells Tim that she is unconvinced of Gina's innocence. Billy tells David about the funeral fracas leading David to reconcile his anger. Although supported by Gail, Shona soon has a visit from the police. Gemma thanks Rita for letting Paul stay and tells her all about the new bail hostel. 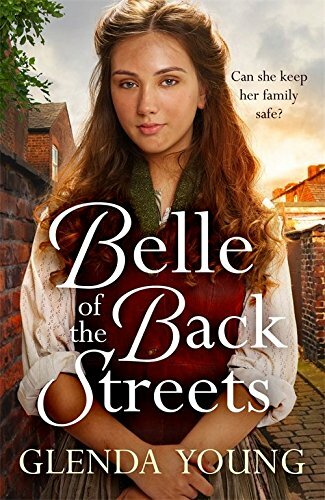 Rita fills Claudia in on the new bail hostel which they both denounce. Billy, however, being the professional Christian, disagrees with the raving redheads. Tracy goes ballistic at Bethany about the 'miscarriage' until Bethany coaxes Amy into telling her that she actually had an abortion after all. Amy also admits the truth to Steve. Tracy and Steve feel guilt at being selfish and ignoring their daughter's plight. 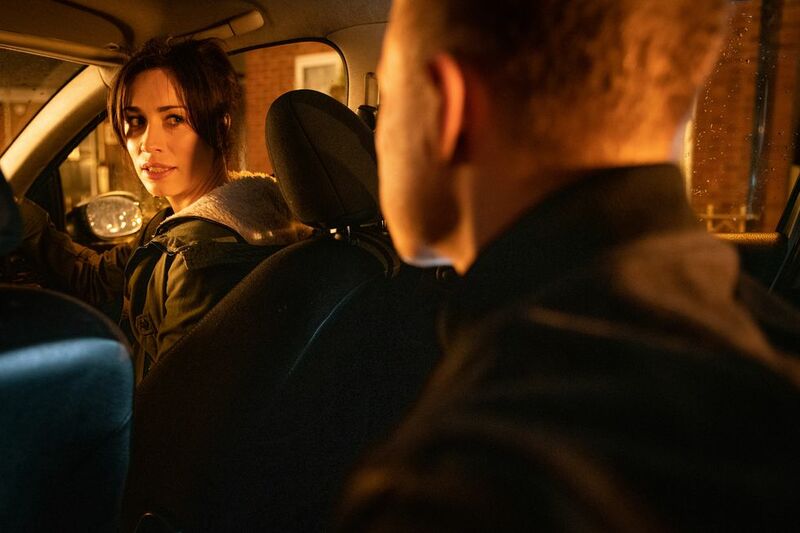 Questioned by a detective, Shona tells them that she doesn't know where Clayton is, and she probably isn't a target for the fugitive either, yet Clayton remains on the run. With Lily poorly, Shona heads to David's car to take some medicine over to Nick. Getting in the car, Clayton is hiding behind the driver seat, and pleads with his mum to drive! Anyway, that's all for this Wednesday. Your thoughts on this mid-week double? You can follow me @rybazoxo over on Twitter, your self-styled 'Cobbles Connoisseur'. She's not had much luck with the men in her life but now Eileen Grimshaw looks set to have a new fella on the show. Next week's Coronation Street previews from ITV say that a new builder turns up on the street to work with Gary Windass. Gary reveals to Carla that he has hired Jan to help him with the factory roof while Carla reiterates that she is not getting a new roof until absolutely necessary. Meanwhile, the previews say, Seb is less than impressed when Jan charms Eileen. Jan will be played by actor Piotr Baumann whos played Polish shopkeeper Konrad Topolski in EastEnders.